Burns, a professor of social psychiatry at Oxford, brings to this manifesto a carefully measured combination of personal and professional experience. He has been a psychiatrist for over 40 years, working in both research and clinical care and thus was both participant and observer as deinstitutionalization and new pharmaceuticals took hold, and as diagnostic manuals with a troubling tendency to pathologize most of human behavior rolled off the presses. This book is for the lay reader, Burns says, someone curious about psychiatry as a potential consumer of services or simply interested in the field. He does not expect that it will be “read religiously from first page to last,” but rather more impressionistically, a chapter here, a chapter there, guided by the reader’s interests, becoming a kind of free-associative exercise. This seems an unnecessary conceit, a way of hedging bets, or perhaps a reassurance to the more distracted among us that we needn’t sustain attention for two parts, 13 chapters and 293 pages of text to get something out of this book. He sells himself short because, despite some repetition, the book as a whole becomes a compelling narrative, chronicling how modern psychiatry developed and declined, a victim of its own success and arrogance and sloppy thinking. Nonetheless, he argues, the discipline casts a “necessary shadow,” one that is intimately and irrevocably linked to the inevitable human condition of mental illness and all its suffering. He highlights some of the grimmer aspects of the profession: the asylums, the insulin comas, the lobotomies, the horrors of Nazi psychiatry, and the crackpot fads such as “recovered memory” that caused terrible suffering. He also elucidates some of the breakthroughs, the exploration of the unconscious, the benefits of medicine, the background of forensic psychiatry, the real artistry of diagnosis when physical points of reference are absent and, most important, the relief of monumental suffering. The first chapter, “What to expect if you are referred to a psychiatrist,” has all the markings of an appendage, a chapter requested by an editor who was worried about sales. Burns carefully normalizes that first visit to a shrink and then walks us through the taking of the patient’s history, mental and physical exams, and eventual diagnosis, so that anyone who is sufficiently sophisticated to seek out this book but utterly innocent in the workings of a clinician could walk away with news he can use. 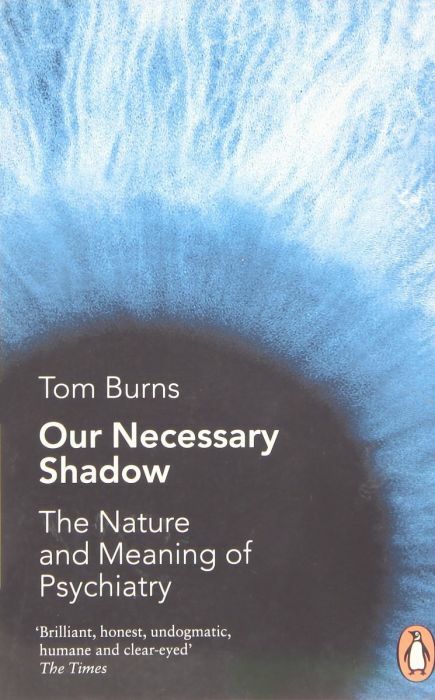 When Burns embarks on his narrative, he gives the reader a sweeping overview of the profound and demanding relationship society has had with those who have suffered from troubled minds. In the course of his narrative we meet, of course, Sigmund Freud, but also William Tuke, a Quaker who brought compassion and “moral therapy” to those in lunatic asylums. And the scary New Jersey psychiatrist Henry Cotton, who decided that bacterial infections were the root of mental illness and began treating inmates by removing supposedly infected teeth and moved on to tonsils and even colons while the psychiatric establishment of the 1920s and ’30s looked on without comment. Burns clearly despairs at what has happened recently to his beloved profession and his chapter “A diagnosis for everything and the medicalization of everyday life” is an impassioned, rigorously argued indictment of ODD (Oppositional Defiant Disorder), FSAD (Female Sexual Arousal Disorder), and the alphabet soup of what he calls “improbable-sounding new diagnoses floating about.” He insists that alcoholism and other addictions should not be considered mental illnesses because, unlike with mental illnesses, the addict is the only person able to effect change. Would that a person suffering from schizophrenia could will him or herself to sanity. “Are psychiatric disorders . . . illnesses like pneumonia or arthritis? Or are they just a part of an individual’s unique identity?” he asks. “Such philosophical questions engage serious thinkers in heated debates in a way that does not seem to happen in dermatology or neurology or any of the other medical specialties. There is clearly something that has always been different about psychiatry.” Throughout this insightful and learned book, Burns poses questions, and offers some answers, that reveal the problematic nature of his profession and establish him as a thoughtful, erudite guide through a demanding landscape.